Love this post! A collection of many ideas here. On a @carlaLeeB post I suggested that perhaps the word ‘symbiotic’ is more accurate? Your thoughts on traditional #pegeek practice were quite unexpected at first. I think there are so many thoughts that apply for many KLA’s here, including #mathematics. The same critical skills exist. Perhaps time for a cross-post? Great blog highlighting many very key and important messages. It’s also good to hear that currriculums are beginning to move with the times and recognsie the broader outcomes to student learning in physical education and processes to enhance learning. Linking to your point about teachers I read an article by Armour (2010) last week that said should re-define teachers as teachers to teachers as learners. In this way teachers continually question their pedagogy to find the most effective up to date way to enhance student learning and promote the physically active life. Have you read any of David Kirk’s stuff physical education futures? – similar messages to your blog. Love what you posted here. I would love to work using mobile devices in my classroom (the gym, the field, the pool, the bowling lanes…) to access the many features available on them to enhance student (and teacher) learning. In a perfect setting I’d have a class set of iPads! Why not use the tech that the students already have to help them learn. I am hoping to get a policy change so students can begin to use the device for things like video assessment and QR code scanning in a PE setting. Great post! Great post highlighting what needs to be at the forefront of our thinking as we move towards the Australian Curriculum. 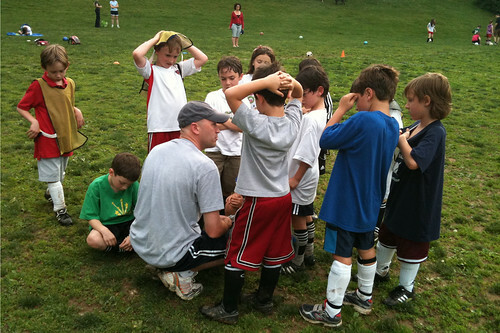 I particularly like your point about the term “coach” – a great role but the name itself does have negative connotations to some unfortunately. “Mentor” springs to mind but I still quite like “coach”. On a similar note, recent talk at school about school planning has lead us to refer to “welfare initiative” now as “wellbeing initiatives” which I see as a more holistic and postive term. I think that the article has some very good points but I think that the name of what you call the head of the class – coach, instructor, teacher, etc. – is just semantics and misses the larger problem with PE. I am also concerned with the argument that PE should not piggy back on the obesity movement. Current trends show PE going down: programs are being cut, funds are running out, and teachers are let go. Some states have tried to raise standards. But they have, for the large part, failed. Many states have not raised standards. For example, in some states, PE is not taught by certified PE teachers. How can we expect PE to improve if we do not have qualified teachers teaching the subject? The list goes on. Something has to change. The best way is to latch onto a movement, such as the obesity movement, which physical activity and education can, and should, be a significant part of the solution, in order to both improve PE, but also to decrease rates of, and prevent incidents of, obesity. We need more funding for teachers, training, facilities (some schools do not even have gyms), and time requirements that are enforced. Otherwise, it doesn’t matter if you call PE teachers a coach, mentor, etc. Once you have that base, you can implement programs that integrate technology. Otherwise, we may be witnessing the death of PE. Thanks for the interest in this post and the blog. I appreciated your thoughts on the idea of raising standards in PE, the observation that PE isn’t being taught by specialists and the need for more funding for PE initiatives generally. I have to take issue with a couple of things though. I don’t think the role we play in leading our students should be put down to a semantic argument on titling. If we persist in seeing ourselves as teachers, as the font of all knowledge, rather than coaches helping the students learn themselves then we risk making achieving any improvement (quantitative or qualitative) that much harder. This issue has probably got a lot to do with outdated pedagogical constructs still advocated by some preservice training organisations (probably a topic for a whole separate blog post). Quite often the theory gleaned during preservice training is often at odds with the reality of day to day teaching. The second point I’d make is hitching PE to a topical cause can be problematic. You run the risk of not achieving the very standards you speak of, without adequate resourcing. I wouldn’t want to nominate an success rate regarding the prevention or reduction of obesity in the students I teach that was dependent on the resources I specifically get for that program (which is zero at the moment). By adopting a more holistic approach to Well Being education, I feel you have a much better chance of bringing about the attitudinal change needed to, in turn, bring about behavioral change. And let’s face it, obesity is actually a symptom of deeper health related issues like self concept, relationships, nutrition and exercise to name a few. Bottom line, there is no easy answer, but an “eggs in one basket” approach to healthy lifestyles is not the way to go, in my humble opinion.